What do you do after your blog has been turned into a highly-noticed book and Meryl Streep and Amy Adams have starred in the film version? Fleisher’s has launched a formal butchery apprentice program that has already graduated three successful butchers. 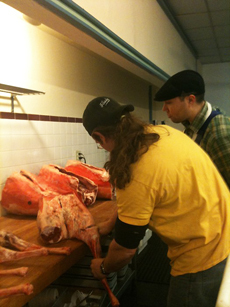 If your New Year’s plans include training in the culinary arts, learn more about Fleisher’s butcher classes. As the Fleisher’s folks say, Carne diem! Learn your cuts of beef and cuts of lamb in our two popular meat glossaries. trade) of fine butchering. Photo courtesy Fleisher’s.